Park rangers recovered the bodies of 29-year-old Vishnu Viswanath and 30-year-old Meenakshi Moorthy from about 800 feet below Taft Point. 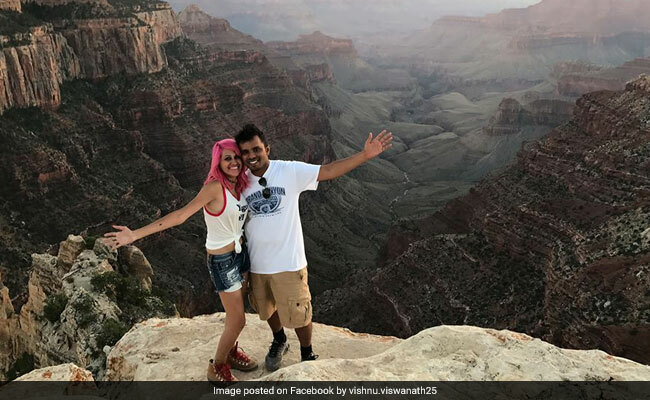 In a recent Instagram post, Moorthy posted a photo of her sitting on the edge of the Grand Canyon and reflected about the "daredevilry" of taking pictures from unsafe locations. Jishnu Viswanath said Moorthy had set up the tripod by the ledge last Tuesday possibly to take a selfie. Sooo today on #socialmediabadasstribe we are talking about limits of #doitforthegram.Yeah sure it can be limitless but guys, we reaaaallly need to have boundaries (this is handy as life lessons too but we will revisit that later) A lot of us including yours truly is a fan of daredevilry attempts of standing at the edge of cliffs ⛰and skyscrapers, but did you know that wind gusts can be FATAL??? "She gave me the willies". The college said Viswanath and Moorthy belonged to the BTech 2006-10 Computer Science and Engineering batch. "I will be also shining my pink light of positivity from time to time, on what can get use close to the ever elusive 'happily-ever-afters, ' or whatever that sh-t means". Instead, she said, they managed to work remotely and spent their spare time exploring. Moorthy documented their adventures on a blog called Holidays and HappilyEverAfters, posting happy snaps of her husband and musings they had throughout their travels. Yosemite is one of the most photographed places in the world and fatal mishaps have increased with the advent of social media, Michael Ghiglieri, who co-authored a 2007 book that chronicles fatal misadventures in the park, told the Los Angeles Times. "I mean, it's very treacherous out there", said Matteson. Viswanath and Moorthy married four years ago in southern India, said Dr. Nisha Kuruvilla, a professor who knew the couple. Park rangers are investigating but say the cause of death may never be known. The couple had recently moved from NY after Viswanath took a job as a systems engineer at Cisco, based in San Jose. In India, after a rash of selfie-related deaths, the Tourism Ministry in April asked state government officials to safeguard tourists by installing signs in areas where accidents had occurred declaring them "no-selfie zones".